We are members of an international team of people who are concerned about the destructive consequences of ecological “restorations.” Trees, Truffles, and Beasts (1) was recommended to us by one of our collaborators in Australia because the book was written by several academic scientists in Australia and the Pacific Northwest of the United States. The book compares and contrasts the forests of these disparate locations and finds that below the ground, they have much in common. The soil is inhabited by millions of microbes that decompose organic matter, making it available to plants as nutrients. These microbes recycle dead plants and wood back into usable material for living plants. Nitrogen is essential to plant growth. Microbes and fungi in the soil convert nitrogen in the atmosphere into forms needed for plant growth. Specific plant species (e.g., legumes, such as acacia and lupine), called nitrogen “fixers,” are mediators in this process. Fungi in the soil deliver water and nutrients from the soil to the roots of trees in exchange for carbohydrates provided by the trees. This symbiotic relationship is essential for the health of trees and in the absence of fungi, tree growth and development are severely retarded. 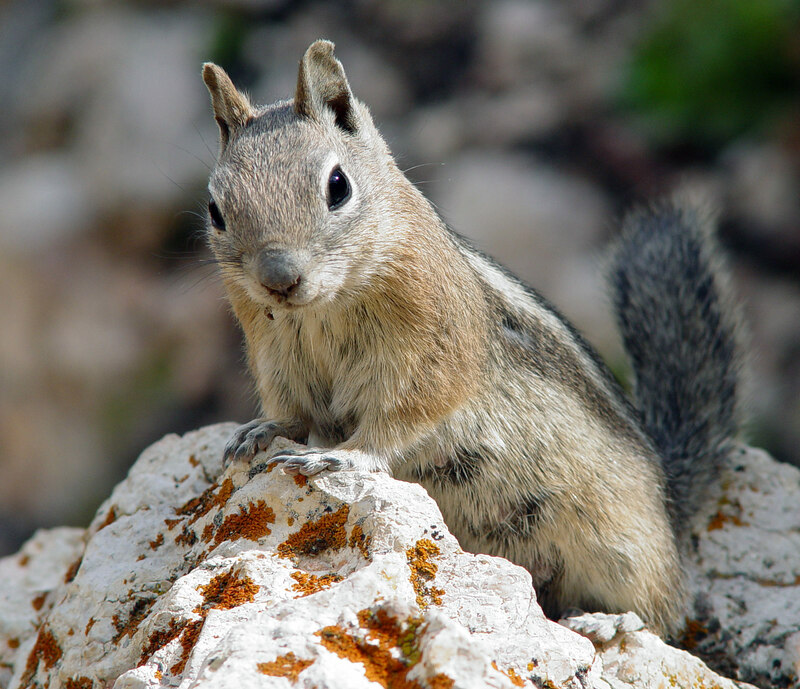 The animals that live in the forests contribute to forest health and forests also benefit the animals. Fungi in the soil produce “fruiting bodies” that are their means of reproducing. Fruiting bodies above ground are called mushrooms. Fruiting bodies below ground are called truffles. In both cases, they are important sources of food for animals. The animals in Australia are different from those living in the Pacific Northwest, but they have in common that the fruiting bodies of fungi are equally important sources of food for them. In the case of mushrooms above ground, dispersal of their spores is accomplished primarily by wind. But in the case of truffles, dispersal of their spores is dependent upon the animals that eat them and “deposit” them elsewhere. So, animals are crucial to the reproductive cycle of fungi that fruit below ground. Long-footed potoroo is a rare Australian marsupial that eats primarily mushrooms and truffles. In their search for truffles, the animals also till the forest floor, which contributes to the decomposition of leaf litter and the dispersal of nutrients into the soil. As the animals defecate in the forest, they are also making contributions to forest health and there are species of microbes and insects that specialize in the use of animal feces. 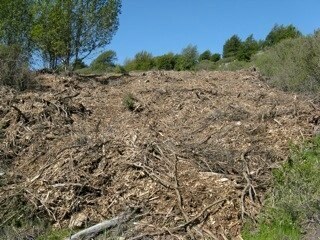 What happens to the forest ecosystem when it is clear cut? 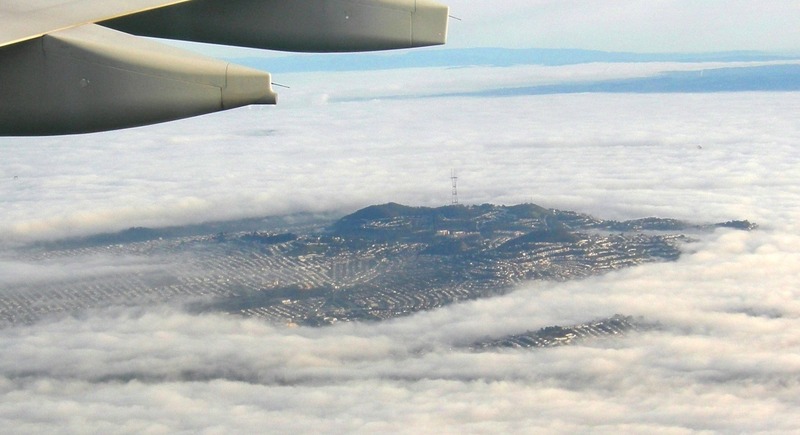 The Bay Area is often blanketed in fog. Courtesy Save Mount Sutro Forest. The forest precipitates fog and the shade provided by the canopy retains that moisture on the forest floor. When we destroy the forest, we lose that source of moisture. The ground dries out in the sunshine. The fruiting bodies of fungi—mushrooms and truffles—require moisture to bloom and they die quickly in the absence of moisture. The herbicide (Garlon) used to prevent the trees from resprouting is known to damage the mycorrhizal fungi that are essential to forest health. The herbicide that is applied to the tree stump immediately after the tree is destroyed, travels though the cambium layer of the tree down through the roots of the tree. The tree is killed by killing its roots. Mycorrhizal fungi are essentially extensions of the root system. When roots are killed, so are the mycorrhizal fungi. In the absence of mycorrhizal fungi, the survival of “replacement” plants is compromised. The loss of fruiting bodies as food for animals reduces animal populations and the contributions they make to forest health. In the absence of fungi and bacteria, the soil is essentially sterile and is no longer capable of contributing to the health of a new generation of plants and animals to replace the forest. Trees, Truffles, and Beasts was written by academic foresters who are primarily concerned about the destructive consequences of destroying native forests and replacing them with timber plantations, often of another, faster growing species. Ironically, in the case of old growth eucalyptus forests in Australia, the choice of replacement species is often Monterey pines. Since some of the species of mycorrhizal fungi are specific to certain species or types of trees, this change of species is not successful without the inoculation of appropriate species of fungi. For example, some of the mycorrhizal fungi that grow on the roots of conifers are not found on eucalyptus species. 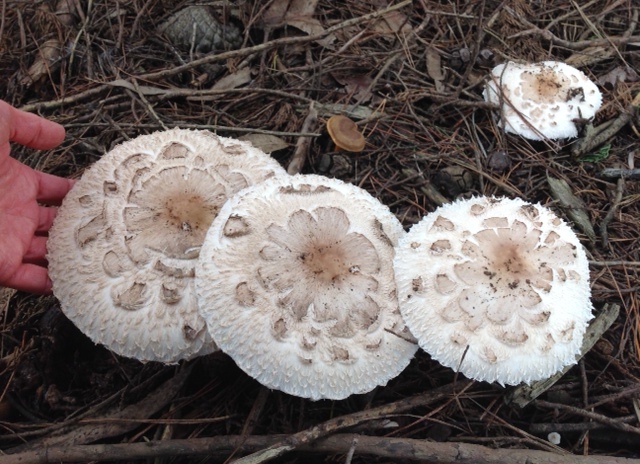 Before writing this article, we corresponded with the authors of Trees, Truffles, and Beasts to confirm that fungi are found in the eucalyptus forests of California. Since eucalyptus was brought to California as seeds, rather than potted plants, we needed confirmation that our eucalyptus forests are also enjoying the benefits of mycorrhizal fungi. We are grateful that the authors replied. They report that eucalyptus forests in California are populated with fungi, including some species that are native to Australia, which implies that some eucalyptus were imported from Australia with native soil. Therefore, we can assure our readers that our description of how the forest functions applies to the eucalyptus forest in California, as well as in Australia. The moisture available to plants will be reduced by the loss of fog drip and shade provided by the tree canopy. Fog drip in eucalyptus and Monterey pine forests in the East Bay has been measured at 10 inches per year. (5) Young plants and trees require more water than established plants, so the water deficit will retard the growth of a new landscape. The climate of the San Francisco Bay Area has changed in the 250 years since the arrival of Europeans. Plants that were native at that time are no longer competitive in the warmer, drier climate and an atmosphere higher in nitrates and carbon dioxide. The rapidly changing climate is making the concept of “native” increasingly irrelevant. And now we know that the damage that will be done to the soil and the forest floor by the destruction of our urban forest will further handicap the successful establishment of a new landscape. Aside from the physical damage done by removing hundreds of thousands of trees with heavy equipment, the herbicides used to kill trees and plants considered undesirable by the perpetrators of this devastating project will sterilize the soil. The resulting weed-dominated moonscape will probably recover in hundreds of years, although the eventual outcome is impossible to predict in our rapidly changing environment. Neither the supporters of this project nor its critics will live to see the recovery. I hypothesize that you either did not discuss prescribed burning with Maser and Trappe, or you did so too narrowly, or you failed to incorporate all they said about it. Does my hypothesis fail based upon evidence? I provide a verbatim quote from the book. What more do you want? There is more on the subject in the book. For example, there were follow up studies that indicate burned plots have significantly fewer fruiting bodies one year later. However, the affect of fire on fungi also varies by species. This is a 232-page book that cannot be summarized completely here. I am familiar with the authors and personally with one of them. I believe that, if questioned, they would have provided a more nuanced view of prescribed and wild fire as related to forest mycology than that which you appeared to focus on in this article..
You do such good work overall and a great deal specifically, I assumed you would want to increase the sophistication of your understanding of how fire fits in — if not only because you appear to approach your work from a whole-system perspective, appear to highly value healthy ecosystems, and fire is one of the most essential ecosystem processes. Wildfire, thus including high-intensity as well as high-acreage wildfire, has been part of the dance for at least almost as long as fungi have. The notion that wildfire is generally “bad” for fungi (even the species most sensitive to it) from a whole-system perspective, or even a regional perspective, or even a watershed or fireshed perspective, or even categorically from a stand perspective, cam not be correct, and is not correct. And prescribed fire (other than so-called “back-fires” used to “fight” wildfires) is very most often less intense than are wildfires, so to give the impression that prescribed fire is a bad thing for ecosystems is an untenable position. Perhaps you did not mean to convey that message. But it read that way to me. Much of the book I have cited is devoted to fire that my article does not cover. I agree that fire is an essential element in the forest ecosystem and in Western North America, an entirely natural phenomena. However, prescribed burns are another matter. They are, by definition NOT natural, which is not my objection to them. There are undoubtedly justifiable reasons for conducting prescribed burns. However, here in the San Francisco Bay Area—which is the focus of my blog—prescribed burns are being used primarily to destroy non-native vegetation and to prevent natural succession from grassland to shrubs and climax forest. In that case, a cost-benefit analysis is appropriate and necessary. There is much risk and much cost to the environment of prescribed burns. The perceived benefit of artificially maintaining grassland does not outweigh the risks or the costs in my opinion. I have accurately quoted the source I have cited on this subject. However, you are correct that there is much more that could be said about fire ecology, but that is not the subject of this post. Although your paragraph characterizing prescribed fire was worded broad-brushedly, perhaps I failed to consider that all your other readers might understand that you were speaking of the use of prescribed fire within only the narrow context of the SFBay area landscapes. For those who have little direct experience with other ecosystems, I hope they read your reply to me above, so that they do not mis-extrapolate when weighing in on the use of prescribed fire in other ecosystems. I have been part of the cutting-edge of educating/advocating regarding fire management issues for 25 years, and PNW culinary truffles for at least 7 of the last 12.. It has involved a lot of time felt like trying to swim upstream while beating on wooden heads. It is especially hard it to take when someone who knows what that is like writes in a way that allows incorrect perceptions to be bolstered. I may have over-reacted. Keep on keeping on. If I lived in the Bay, I would at least have treated you to dinner by now. I consider your style, efforts, and questioning of the sacred cows of ecology to resonate with my eyebrow raisings and scrunchings in reaction to them since 1972. In my opinion, it was a systemic error for the genre to have attempted to gain respect as a science by so fervently trying to copy the Reductionstic model of the “hard” sciences. Hi Million Trees and All working to protect Trees and Life as we know it on planet Earth.The underground ecology, part trees play in it, and effect of herbicides on the soil might be a break through with adamant and well meaning environmentalists of a nativist bent. Nativists would do well to protect and plant life forms they love without destroying so much else that is beautiful and valuable. Nativism is a mind set, i.e. a mind that is set. What we know about mind sets is they are tenacious in using and interpreting everything, fact or wild unfounded notion, to reinforce the set their mind now accepts as Reality. The latest info in Death of a Million Trees may contribute to the evolution of the mind set “eliminate non-natives” to promotion of careful research into what is truly harmful to the environment to the best of out knowledge. When I was working mid-’90’s with Californians for Alternatives to Toxics while living in the toxic Sonoma Valley, a group of us started our grassroots Sonoma Pesticide Alert, precursor to East Bay Pesticide Alert, and we distributed CATs’ Wine Grape report which was based on 1995 records from the county Ag. department. In that report were tox profiles put together by CATs staff scientist of pesticides commonly used in the Sonoma and Napa wine industry. The URL above is from the page in that report on Monsanto’s Roundup. The news about the effects on mycorrhizal fungi are not new; in that Wine Grape report’s Roundup profile, you’ll see the references which go back to Sidhu, 1990, on mycorrhizal fungi and habitat. In 2005 when EBPA was responding to the massive EB Hills decimation program before we understood how extensive it was, but recognized the danger of a pesticide approach, we presented this specific profile, along with others about the specific pesticides for the program, and others used already by some of the agencies in question, which we realized might also be used. We pointed out the danger of Friends of Sausal Creek’s and Jean Quan’s plan to use pesticides around Sausal Creek and Dimond Park to try to kill of “non-natives”, pointing out, specifically that, this plan would in fact endanger “native” plant life which developed in that ecosystem getting help from the fungi population which delivers needed nutrients to the “natives” population. Yes, any obliterated landscape can come back to life, and a habitat can be created again, but the question is whether there is any good in removing one habitat for another, particularly during our volatile times of climate change. We need slow and steady change which comes naturally in response to changes in our environment, not some political maneuvering whose effects once again I viewed yesterday at Dimond Park, immediately East of the shopping area on Fruitvale Ave. FOSC and Jean Quan, who were led by UC to be part of the overall hills trees decimation plan, have removed the healthy redwood ecosystem which grew up over a full century (go to friendsofdimondparktrees.wordpress.com to see the lies on which the downing of most of the redwoods in the park were based). So now there are all these baby trees planted alongside some of the young redwoods which were not cut down. It’s a scandal. And it is a massive gardening project, what we always see with these “restoration” projects. For a year the landscape has been dominated by bulldozers and now what was a cool, foggy climate in the park has been changed to a hotter climate, as friends of mine who are not active at all on these issues, point out each time we’re there. People feel it in the heat coming up through the soles of their shoes, even when we’re sitting under a tree which is not right alongside the decimated area. For anyone local to the Bay Area, I invite you to take a quick look at Dimond Park which is quite literally, as little as 15 minutes from downtown Berkeley. Part of the pity for me, besides the loss of the tall trees and moist, cool habitat is that, kids were used as pawns in pushing this agenda. They have been rounded up last couple years, particularly after the politicians and UC succeeded in putting these plans in place, to participate in a “restoration” project. They’re being told they’re doing something good. How many of those kids from Berkeley and other areas had ever been to the redwood ecosystem of that creek area before getting involved? And then they’ll be getting media attention as though they have been heroic in making change. I can only hope that at some point they will be shown photos of the redwoods, will think of the displaced raptors and other wildlife, and will see the maps of where the creek was a century ago, and will realize that they were used. We can hope they then will wake up and will speak out about how they were used. Thank you so much for this brilliant article. It is just common sense, but nativists by their nature avoid thinking with sense. People devoted to poisoning also ignore that it’s inevitable that they will come back to harm humans and is why the cancer rate is so high. Glyphosate in even organic wine and food should be no surprise. Of course a poisoned land can’t be easily restored. I still can’t believe those advocating for native plants want to poison every eco-system they can, including the bay, ocean, lakes, rivers, streams, and don’t seem to realize the effects. It’s been so long since Rachel Carson warned everyone…. First of all, a very interesting article. It seems to me that the forest should stay as is. Yes, Helen. We agree. Even if we prefer another species of trees, we must take into consideration that destroying existing trees will cause a lot of unnecessary environmental damage. Our existing eucalyptus forest is expected to live another 200-300 years, based on their life span in their home range. Killing them prematurely cannot be justified given the damage that would be done.